OMAHA, Neb.--(BUSINESS WIRE)--Aug. 15, 2017-- Marcus® Hotels & Resorts, a division of The Marcus Corporation (NYSE: MCS), and Marriott Hotels announced today the official opening of the Omaha Marriott Downtown at the Capitol District in Omaha, Neb. The 333-room, 12-story hotel is the first new full-service premium hotel to open in Omaha in more than a decade. It also serves as a major anchor of the Capitol District, an upscale urban destination dining and entertainment district located in the heart of downtown Omaha. Marcus Hotels & Resorts is a minority investor in the property and is managing the new hotel. Marcus Hotels & Resorts owns and/or manages 18 hotels, resorts and other properties in the U.S. The company’s distinctive portfolio includes city-center meeting hotels, upscale resorts, historic properties, and premium branded and independent first-class hotels. Marcus Hotels & Resorts is an approved operator for all major lodging brands. A leader in the hospitality industry since 1962, Marcus Hotels & Resorts creates asset value for hotel owners through its expertise in management, development and product repositioning, including hotel food and beverage concepts developed by its Marcus Restaurant Group, featuring premier brands such as Mason Street Grill, ChopHouse and Miller Time Pub & Grill. The company is also growing its experiential restaurant concept, The SafeHouse, with a second location that opened in early 2017 in Chicago, Ill. For more information, please visit: http://media.marcushotels.com and follow the company on Facebook and Twitter (@MarcusHotels). With nearly 550 hotels and resorts in over 55 countries and territories around the world, Marriott Hotels is evolving travel through every aspect of the guest's stay, enabling the next generation to Travel Brilliantly. 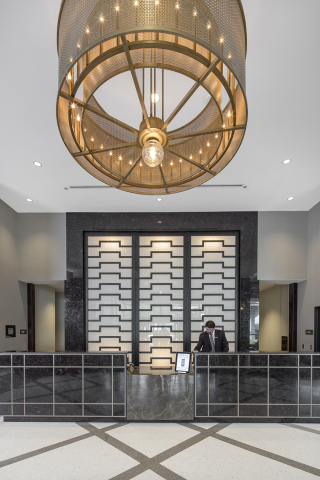 Boldly transforming itself for mobile and global travelers who blend work and play, Marriott leads the industry with innovations, including the Greatroom lobby and Mobile Guest Services that elevates style & design and technology. Marriott Hotels is proud to participate in the industry’s award-winning loyalty program, Marriott Rewards® which includes The Ritz-Carlton Rewards®. Members can now link accounts with Starwood Preferred Guest® at members.marriott.com for instant elite status matching and unlimited points transfer. To learn more, visit www.MarriottHotels.com. Stay connected to Marriott Hotels on Facebook, @marriott on Twitter and @marriotthotels on Instagram. The Capitol District is Omaha’s newest downtown entertainment district. The District surrounds a technology-smart, modern town square and will feature a 218-unit high rise apartment tower, a full-service Marriott hotel, Class A office space, plenty of adjacent parking and over 20 diverse restaurants and bars – all within walking distance of Omaha’s best civic, cultural and entertainment venues and the Riverfront. The Capitol District will connect, invigorate and entertain Omaha. The District will welcome people year-round at all times of day by hosting collaborative events, live music and everyday fun. The Capitol District is being developed by Shamrock Development, an Omaha company that specializes in creating urban mixed-use developments. For more information, visit www.capitoldistrictomaha.com.